Pacifica high school Oxnard,California / MMI III (Weak shaking): I felt the earthquake me and my classmates were just taking notes in our geography class and then we just felt shaking a lot of us were scared me and one of my classmates felt dizzy when it was happening. Maravilla Senior Residence Santa Barbara CA. Apart (128.5 km NNW from epicenter) [Map] / MMI IV (Light shaking): Was napping. Whole building shook, but not in an alarming manner. Knew it was definitely a quake. Just lasted one or two minutes I think. Twin Falls, Idaho (1228.4 km NNE from epicenter) [Map] / MMI III (Weak shaking): I was in bed I was taking a nap and then I start felling like my bed was shacking it was very light but the feeling was very weird, at first I thought I was shackling, but then my dog god scare, he yump in to my bed and he was scare then he start howling. Port Hueneme, NB Ventura County / MMI IV (Light shaking): Not bad. It was a quick jolt. Got us talking in the office but no damage, no injuries. Indianapols, IN / MMI II (Very weak shaking): I could feel a vibration in my second floor office desk for almost two minutes. Las alamos (122.8 km NNW from epicenter) [Map] / MMI V (Moderate shaking): Shaking and swaying was outside, lasted longer than I expected, some neighbors did get children outside. No damage noticed inside. Not described in ratings listed . 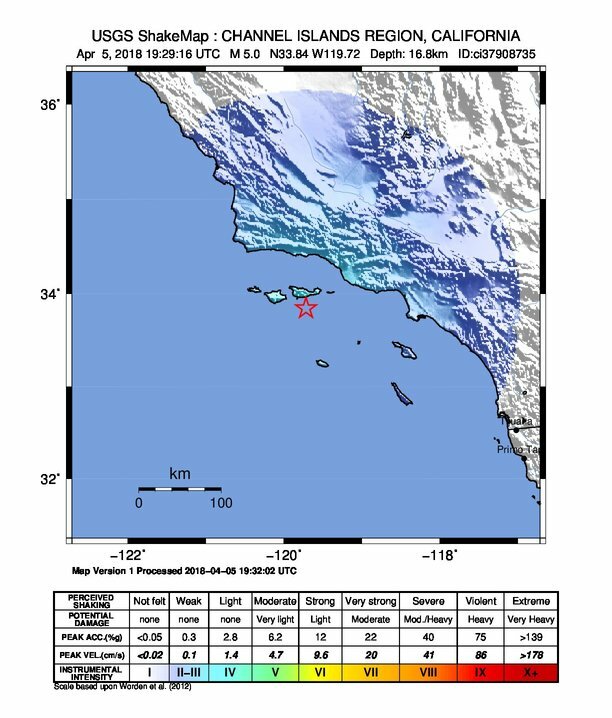 Oxnard, ca (82.5 km NE from epicenter) [Map] / MMI V (Moderate shaking): Nothing in our home actually broke or fell over, but I'd say it was a little more than MMIV Light. We both felt it good and some items in cabinets rattled quite a bit. Enough to head downstairs and outside ASAP. East Whittier, CA / MMI III (Weak shaking): While at my computer, saw lamp swinging slighly, then noticed door bell chimes and wind chimes swaying. I felt very slight swaying movement as I stood up. Movement lasted over 15 seconds. North Hollywood (148 km ENE from epicenter) [Map] / MMI IV (Light shaking): Jolted the walls and floor 2 to 3 times and produced side to side movement which lasted for quite some time, bevause 6th floor apartment is on rollers. NBVC Port Hueneme / MMI V (Moderate shaking): Felt initial jolt, then rolling for a few seconds afterwards. Everyone inside felt, people outside felt. Small items moved or fell. Santa Barbara / MMI IV (Light shaking): Not dumb. At computer / decided to duck under the desk, so nothing would fall on me. long beach, ca (156 km E from epicenter) [Map] / MMI IV (Light shaking): I was outside sitting in my car and it was shaking from side to side. I thought my coworker was rocking it as a joke. Santa Barabara, Ca. / MMI VI (Strong shaking): My worst nitemare... sitting on pot... felt initial HARD Jolt... "OH, NO"...shook back & forth several seconds... a bit of roll too. Scary. Went outside in case of after shocks. Neighbors outside too. Nothing fell inside or outside in patio. Irvine / MMI IV (Light shaking): Was sitting in my car charging it outdoors when the shaking started. Brea, CA (326.9 km ENE from epicenter) [Map] / MMI V (Moderate shaking): I was sitting in my parked car and felt the swaying. Thought I was dizzy until I looked it up online. Seal Beach CA (163.4 km E from epicenter) [Map] / MMI IV (Light shaking): I was parked and I thought my car was moving. It shook for a good few seconds, it shook maybe three times. Ventucopa, CA (157.9 km N from epicenter) [Map] / MMI III (Weak shaking): Picture on the wall was swinging back and forth. Woodland Hills (Topanga Cyn. & Ventura Bl. / MMI IV (Light shaking): Felt more like a “rolling” than a “shaking.” Waiting for them to downgrade it from 5.0. Only felt for about 4-5 seconds. Lompoc, Ca (121.3 km NNW from epicenter) [Map] / MMI II (Very weak shaking): Very mild shaking,light tapping of blinds against wall. Santa Paula, Ca / MMI IV (Light shaking): Felt seats moving side to side at DMV. Oxnard Ca / MMI V (Moderate shaking): The second shake was a little stronger. Lasted what felt like 45-60 secs. I noticed the water on my desk and clock in my office swaying. (99.4 km ENE from epicenter) [Map] / MMI V (Moderate shaking): started with a low frequency side to side rumbling that lasted for a bit before becoming a more pronounced rattle that jarred windows and upset teacups and caused the wooden structures to creak loudly. lasted long enough for me to get up, and carefully cross to a safe place and stay in in a bit before it ended. Port Hueneme / MMI IV (Light shaking): I was using the urinal at work and like most men, at the end of my "business" I gave it the three shakes; but on the third shake It was like some out side force gave it some extra power. The third violent shake caused a drop/some splash to get on the guy next to me who just so happened to be my supervisor. Long story short, I'm suspended from work, Thanks nature. North Long Beach, CA / MMI III (Weak shaking): Sitting at my computer and felt some vibration, first floor of apartment building. Very weak shaking, I felt it in my feet. By the time I stood up it seemed to be over. Los Angeles (157.3 km ENE from epicenter) [Map] / MMI IV (Light shaking): Had the feeling of one that was going to grow. Maybe a 10-15 second reminder of the power of the earth and our insignificance in the face of that power. Long Beach, CA (157.3 km E from epicenter) [Map] / MMI IV (Light shaking): Working in office and heard the building move and felt light earthquake while sitting at desk. I turned to my employee (standing 5 feet away) and asked if she felt it but she did not. Port Hueneme (80.6 km NE from epicenter) [Map] / MMI III (Weak shaking): Heard a noise, all the cats ran and then I felt the shaking. Thousand Oaks / MMI III (Weak shaking): It seemed like a very mild quake. No visible damage. Sherman Oaks / MMI V (Moderate shaking): Felt in Sherman Oaks. House shaking side to side. Glendale, CA / MMI IV (Light shaking): Felt light shaking and my mirrored closet doors rattled pretty good. On third floor apartment. Goleta, CA (84.5 km NNW from epicenter) [Map] / MMI V (Moderate shaking): Loud noise followed by shaking, and several after shocks. Thousand Oaks, CA / MMI III (Weak shaking): I would think it was no more than 10-12 seconds. A small TV on a slightly wobbly dresser shook but not in danger of falling or anything. Bikes on wall rack didn't seem to shake. At first I thought it was a big truck but then recognized it. At home in Santa Barbara,-- Riviera neighborhood. / MMI IV (Light shaking): Sitting at desk. Slight rocking motion for a number of seconds, heard house creaking. No rattling of doors or glass. 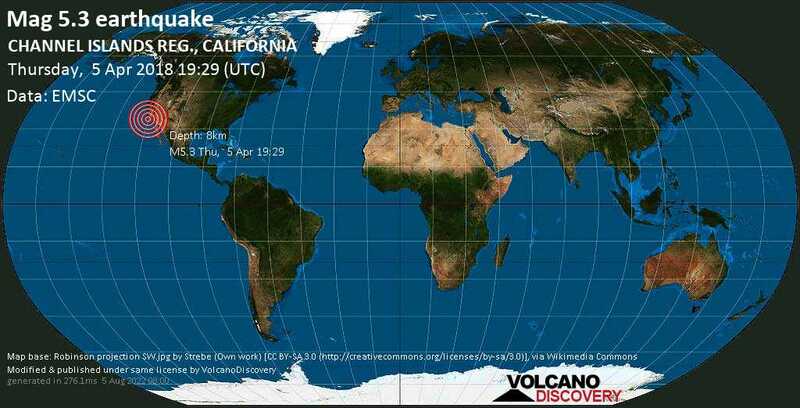 Oxnard California (136.5 km NNW from epicenter) [Map] / MMI IV (Light shaking): Minor shaking. No damage. Lasted about 15 seconds. (105.5 km ENE from epicenter) [Map] / MMI V (Moderate shaking): Two shaking jolts / drops of the earth felt from indoors. Playa del Rey, CA / MMI IV (Light shaking): Gentle swaying of single-family home, lasting 10-15 second. Oxnard,CA / MMI IV (Light shaking): Felt the quake as i layed down in bed, quite evident as i told my gramparents about it and they felt it too. Valencia CA / MMI IV (Light shaking): Rocking as if on a boat. Santa Paula / MMI III (Weak shaking): Like a wave on earth. Ventura, California (next to Ventura College) / MMI IV (Light shaking): A hard jolt, then sliding glass doors rattled hard, light posts swayed, vertical blinds swayed, rolling motion felt.